Oblique Socks - monemades Webseite! 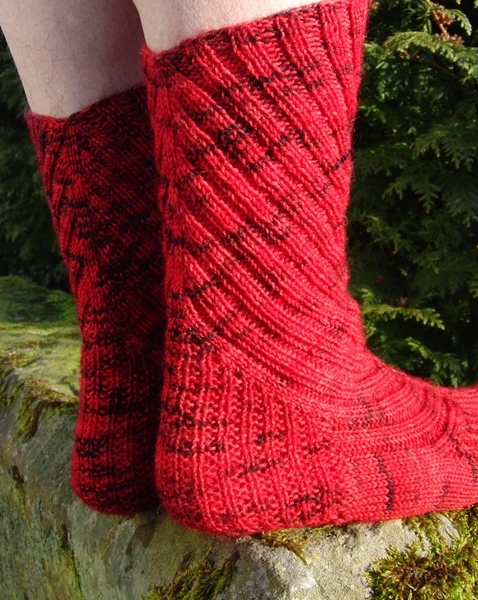 Oblique Socks is the second pattern of mine that was published in Knit Picks Artful Arches Collection. I really enjoyed working on these, because I like the slightly different construction. The slanted cuff, which results from the way decreases and increases are worked to form the diagonal ribbing, give them a quite unique look. The two kinds of ribbing used: diagonal 2x2 for the leg and 1x1 Mistake Rib for the toe and the heel, create symmetrical lines and an array of textures. The socks are knit cuff down with heel flap and gusset. The foot length can be easily adjusted.